The Watermark at East Hill is excited to announce the arrival of Ron Pascoe, our new Dining Director. Ron brings a tremendous amount of education, experience, and talent to the dining program and will be responsible for the day to day operations of the entire dining department. 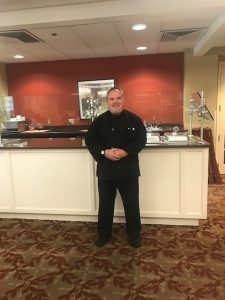 Ron has been working in the senior living industry for many years, most recently as the Corporate Director of Dining for a Connecticut based Assisted Living company. Ron resides in Southbury making his connection to the community even stronger. “Ron is a culinary wiz who enjoys creating a positive experience for residents. It is an honor to have him on the team. I have no doubt residents and their loved ones will find that our Dining Department has really kicked it up a notch under Ron’s leadership and his expertise,” said Kelly Mazza, the community’s Executive Director. There are five dining rooms on campus at East Hill as well as a Cafe and Lounge. Ron and his team serve over two hundred people on a daily basis through restaurant style service including room serve to resident apartments. Creating a culinary program where residents are offered a variety of choices and experiences is part of what makes the community so special. Bringing Ron on board is an exciting change where the culinary future is bright at The Watermark at East Hill.